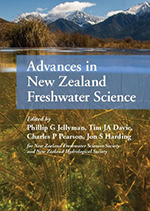 This book published jointly with the New Zealand Freshwater Sciences Society is now available. Price NZ$100 (including postage and handling). A review can be found at the above link. Physical Hydrology: New Zealand Experience. D L Murray & P Ackroyd (Editors) 1979. Water and Land. Conference programme and abstracts for the NZ Hydrological Society Conference. November 2007, Rotorua. Resource Management under Stormy Skies: Water Allocation at the Crossroads. Conference programme and abstracts of the joint NZ Hydrological Society, New Zealand Association of Resource Management, and the Meteorological Society of New Zealand Society. November 2006, Christchurch. Waters for the Future: Balancing its valueProgramme and abstracts of the joint NZ Hydrological & Freshwater Sciences Societies Conference, Whangarei 2009. Extremes. Programme and abstracts for the NZ Hydrological Society/Meterological Society of NZ 2008 Conference, Shantytown, West Coast ISBN 978-473-14372-5. Discounts may be available to booksellers. Please contact the NZHS Administrator (email admin@hydrologynz.org.nz). Contact the NZHS Administrator (email admin@hydrologynz.org.nz). Copy this form and post to the Society Administrator, PO Box 12300, Wellington, New Zealand together with your order or a request for an invoice. Fill in and submit the Order Form below. For personal orders outside New Zealand we request prepayment or credit cards details. Thank you. Visit the Journal of Hydrology (New Zealand) page to purchase issues of the Journal. - All Prices are in $NZ dollars, and include postage and packing.